There is a difference though, Im pretty sure we had to pay cash for sign Demba Ba where as Owen is on a free transfer and is a proven goal scorer at the top level when fit, hes still one of the best finishers around owen is ! He would get 20+ goals in the championship most likely but he nos that hes good enough to stay in the premiership, so why move down. Of course they would, its Huth and Shawcross. There is a difference though' date=' Im pretty sure we had to pay cash for sign Demba Ba where as Owen is on a free transfer and is a proven goal scorer at the top level when fit, hes still one of the best finishers around owen is ! But he's never fit. He hasn't been fully fit playing every week since he was in America? Might have even been before that? If he's good enough to play in the Premier League, then prove it for 6months or a year in the Champ to shut everyone up and prove them wrong. And he's not moving down. He played in the reserve league last season and the season before. If anything it's a move up! Can't believe the way he paraded winning the PL with United when he didn't even play. That didn't sit well with me at all and has also called into his motivation for the game, if he's happy to play maybe 70 minutes in total over a PL season then milk all the glory? If he's good enough to play in the Premier League' date=' then prove it for 6months or a year in the Champ to shut everyone up and prove them wrong. And he's not moving down. He played in the reserve league last season and the season before. If anything it's a move up! Can't believe the way he paraded winning the PL with United when he didn't even play. That didn't sit well with me at all and has also called into his motivation for the game, if he's happy to play maybe 70 minutes in total over a PL season then milk all the glory? I could say the same about Woodgate before he moved to Stoke, Im pretty sure he only played 1 game or so in 2 years, Woody picked up and I think Owen will aswell ! I get your point about Owen paraded winning the PL with United but he was a United player, what do you expect him do, go at home and sit in front of the T.V, he was injured though most of the time, its not really his fault. Havent posted here for a bit so I thought I would pop this article up. Top 10 would be brilliant for us, although tbh I dont think it will happen, thats my honest opinion. A draw with a team like Man City is always good, Crouchy put us ahead, Mancini said in his interview after the game it was like Basketball, apparently Crouch handled it in the box before he scored, I couldnt quite see that from where I was sitting because it was in the goal further away from me and Crouch was facing towards the goal and I was further back. Shame that our defenders werent closer to that Garcia though when he scored, normally pretty good when it comes to heading but he had a header what was pretty much open an our guys werent on him. 4 draws out of 4, would love it if we could make it 5 out of 5 at Chelsea next week. Dissapointing result at Chelsea on Saturday, I did expect a defeat from that but with it being a pretty late goal it was unlucky. 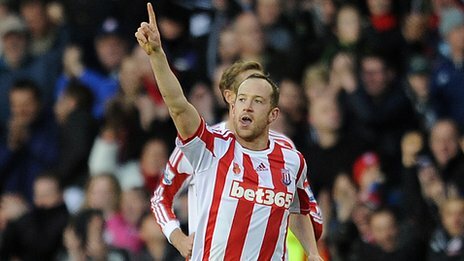 Swansea at the Brit on Saturday, that could be the game we get our first win, looking forward to it. Dissapointing result at Chelsea on Saturday' date=' I did expect a defeat from that but with it being a pretty late goal it was unlucky. Yeh, i'm never really looking forward to playing against Stoke. I'd be delighted with a point away from home going in to a couple of winnable matches. I would say its opposite to that for Stoke because after we play Swansea we have got Liverpool and Manchester United away from home. (2 away games) so if we pick up just a point or less against you then it wont be that good after 8 games although in November we have got matches what are definitely winnable, we play QPR, Fulham and Newcastle at the Brit and we play away at Norwich and West Ham, so out of all them games were capable of getting at least a point each time. Begovic backs Shawcross for England. He has got a point about some other england defenders when he said about some being injured, Ferdinand might still be ignored etc so if its going happen then hopefully next time will be when it does. Hes definitely due a chance. Was easy to tell we werent playing a top club because the atmosphere wasnt as good as normal. A brace from Crouchy, who says hes not good enough for England, still got it. YES, SHAWCROSS CALLED UP FOR ENGLAND ! I think Lescott and Cahill will probably be selected as the main two CB's with Shawcross and Jagielka maybe as cover, I really hope he gets a decent emount of game time though, England will be a lot better to watch if he does play. Tough game at Liverpool today, Owen isnt even on the bench, hope he hasnt got injured. Subs: Sorenson, Upson, Edu, Whitehead, Etherington, Jones, Jerome. Looks like the same starting eleven as last time, same team all the time near enough. Good point at Liverpool today, would of took that before the game. I after admit I laughed a few times when I saw our players flying in on theirs, we got 6 booked, most the starting eleven, Gerrard and them moaning at the Ref, they should man up. Owen picked up a knock before the game so thats why he wasnt involved. Whelan got injured in the first half so hopefully he isnt out for too long, dont think he will be though. Ahh, well he hasnt been playing much but Im surprised hes been told he can go on loan. Abroad or the Championship? Any Championship club would be lucky to have him on loan until January, be interesting see which club he joins up with. "Stokies ill keep you updated I'm not gonna lie I'm gutted like but I gotta play!!" Wolves sign Pennant on loan! So hes joined Wolves, will do well for them IMO. Lol it's just you Ben? I would love to see you start up a Leyton Orient thread see how active that one is. It cant be very good though playing in the third division. I didn't realise that one for that league existed. Meh, the sooner he signs a new contract the better, hopefully he signs a 5 year deal or something. Decent performance at Man United last week, hopefully today we get 3 points against Sunderland, looking forward to it. Would be good to see Owen start, doubt it though, probably come on off the bench, hopefully to score his first goal for us. Not that good of a game today tbh, third goalless draw of the season. That Danny Rose lad is a right cheat, got booked for a dirty tackle then a couple of times later in the game he went down holding his face as if he had been elbowed or something when he hadnt from where I was sitting, he had already been booked, would of loved to have seen him get a yellow card and get sent off for cheating. Bad news is Marc Wilson has broken his ankle , he will be out for a while then so Wilkinson will probably play at LB now, he come on for Wilson when he went off and played their. I think the only back up defender now is Upson, could do with one or two more, I think Jamie Ness or Edu can play LB but cant see any of them coming straight into the first team, Edu might make the subs bench next game. Norwich away next! Hopefully we will get a point at least out of that. 1-0 to them, Johnson scoring from a set piece. QPR at home next week, we should win that, hopefully there wont be a repeat of last year though when we played them. Looking forward to seeing who we draw in the next round of the F.A Cup tomorrow, hopefully its an home tie, the top teams who are in Europe wont be in it, hopefully we get a sh!t team like we did in the COC but this time actually beat them, I wouldnt mind Vale at the Brit. Sorenson's said he could leave if he dosent get first team action. Begovic is in decent form really so I cant see Sorenson getting ahead of him now. Shame we got knocked out of the COC so early, he would of played more then. If he does go though it wont be all bad cause then we could get a younger keeper as cover for Begovic, im 100% sure Carlo Nash will stay as number 3. 1-0 win against QPR at the weekend. It wasnt a very good game at all, the first half was terrible, second half wasnt that much better but I would say it was a bit more open, luckily we sneaked it thanks to Charlie Adam.